Posted 1-23-12 "Donkey Sense: Preparing for Lysts on the Lake 2012" -- ZhiZhu talks about being married to a competitive jouster, Foxfire, and how he is preparing for a jousting tournament. One picture and a couple of useful links. Posted 1-24-12 "Donkey Sense: Could a Jousting Accident Have Been the Reason that Henry VIII Became Such a Tyrant?" -- Information about Henry VIII's jousting accidents. How people worry when their loved ones compete in this dangerous sport. A couple of pictures and several informative links. Posted 1-24-12 "Donkey Sense: Preparing for Lysts 2012 - Jousting Practice Jan 22" -- ZhiZhu talks about her horses, Shadowfax and Ziggy, and how her husband is working with both in preparation for Lysts on the Lake Competitive Jousting Tournament. She also mentions the various other jousters and ground crew that her husband Foxfire trains with. Lots of pictures. Gideon on Saga makes a pass against the quintain. Posted 1-24-12 "Wyvern Oaks: Jousting Practice 1/22/2012" -- JenJ shares information about training her horse, Saga, and her husband, Gideon, for jousting. Includes some info about the armor used. Several pictures and a couple of informative links. Posted 2-2-12 "Wyvern Oaks: Jousting (because no one really cares about anything else we've been doing)" -- JenJ shares more information about training horse, Saga, and husband, Gideon, for jousting. More info about the armor used. Lots of pictures. One video. Posted 2-5-12 "Wyvern Oaks: Saga is a Certified Jousting Pony :)" -- A teaser with two pictures and two short videos leading up to Saga's first jousting passes. Posted 2-7-12 "Wyvern Oaks: Certified Jousting Pony Part II" -- Information about the difference between foam jousting and balsa jousting. Some general information about armor. Why jousters need ground crew/squires. Lots of pictures, several videos. Posted 2-7-12 "G is for Greta: Jousting Practice with JenJ!" 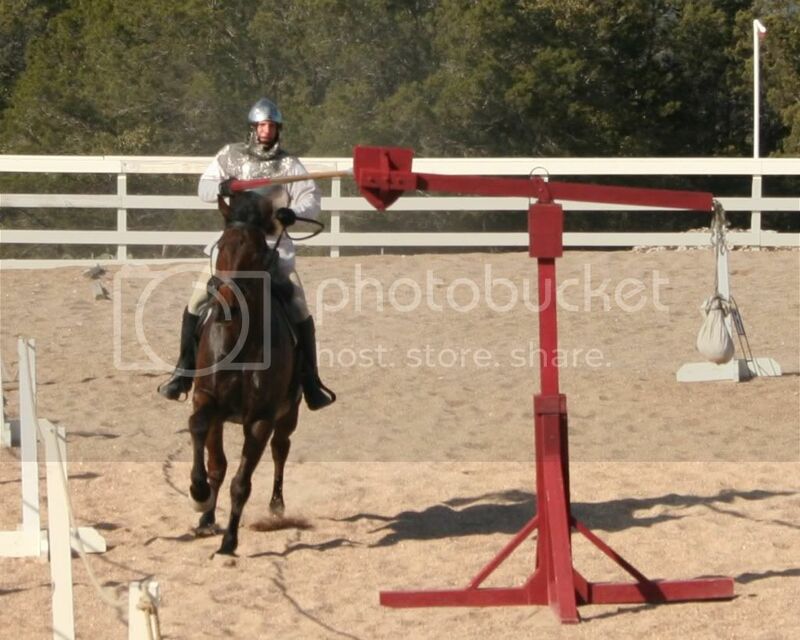 -- Bre shares a nice HD video of jousting practice with JenJ. Posted 2-12-12 "Wyvern Oaks: Jousting Practice Cancelled Due to Snow!!!" -- JenJ shares how she and her husband had to change their plans to practice jousting because it was snowing in Texas! One picture and a link to Bre's blog. Posted 2-12-12 "G is for Greta: In Response..." -- Bre explains why she does not think that JenJ and her husband are insane because they joust. Lots of pictures.